In 1858 William Stott, a local landowner, gave part of Grove Farm and a gift of £2,000 to enable the building of a new church for the Catholic community in Bromsgrove. It was to become known as St Peter's on 'the Rock'. This gift along with the generosity and hard work of that early community produced the church in which we now worship. Today we are rightly proud of our church and visitors continually remind us of how fortunate we are to have such a beautiful building. Young couples are proud to marry in it and have their children baptised. It is a place of consolation for those who have lost loved ones. It is above all else the place where Sunday by Sunday we celebrate the Eucharist. It is the proud home of our worshipping community. 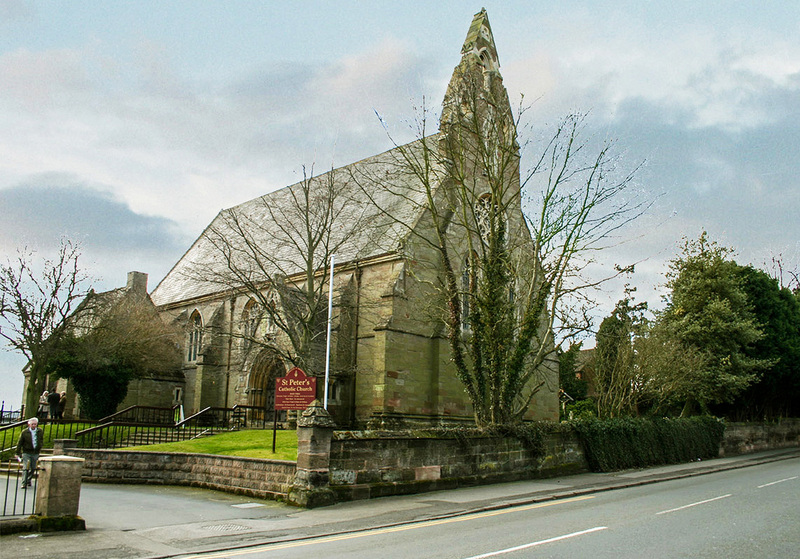 Technically, the church is now a Grade II Listed Building. This means that both the diocese and government require us to have the building properly inspected by a qualified architect every five years to ensure its proper care. In 2003, at the request of the Parish Finance and Building Committee, Brownhill Hayward Brown of Lichfield produced for us an 'Inspection Report.' It is some of the more important findings in this report that I am sharing with you in this letter. The condition of the electrical wiring is described in the report as 'unsatisfactory.' At present it is so unsatisfactory that we are unable to obtain an 'Electrical Test Certificate', which is the guarantee of public safety for those who use the building and a basic requirement of our insurance policy. Given its urgency and importance I have listed it as our first priority, and because we have the funds in hand, hope that work will begin on this as soon as possible. To prevent costly damage it is important that water be keep out of the building. Rainwater has already penetrated the fabric in a number of places resulting in the deterioration of the plasterwork and decoration. A major concern is the condition of the rainwater gutters and downpipes. The system is in need of a thorough overhaul to prevent more serious and costly damage. While work on the masonry and windows is not of the same urgency as keeping the church watertight it is cost effective to do some of this work while the scaffolding is around the church. The two flying buttresses between the sacristy and the sanctuary, disfigured stone tracery in the windows, the rose window, and a number of open joints are all in need of attention. The existing guards on the windows also need to be replaced with stainless steel painted black to avoid disfiguring and discolouring of the stonework. For this work we do not have the funds available and would need to borrow money and repay it over the next five years. If left the problem will not go away and be considerably more costly in the future. We need, therefore, to make every effort to get this work done. In 2002 Nicholsons of Worcester were asked to look at the cost of Restoring the Organ. At the time it was thought to be too expensive. A decision about it has become more pressing. The organ tuner said it is in too poor a condition to tune properly and made a passionate plea for us to do something about it. A plea that has been made by our organists for a number of years! Given all this heavy expenditure last year I put in a request to English Heritage for a grant to help us with this work. Sadly, they replied that they were unable to help. Small grants may be available from other funding bodies, but realistically the task of raising the required funds will be our own responsibility. At the beginning of this year, when the parish accounts were last audited there was £27,025 in the General Parish Account, £23,953 in the Building Fund (raised by the regular second collections) and £19,583 in the Window Fund (raised by the 200 Club). Thanks to your generosity we are able to pay for the rewiring immediately. To undertake the other works we will need to borrow the money and repay it over the next five years. I appreciate that given such a heavy commitment there will be a number of questions that people would like to ask. Please support the committee which has been established to support the venture. St Peter's is a holy place of peace and beauty. One hundred and fifty years ago it was built as a great act of faith. It now falls to us to make a similar act of faith and restore St Peter's on 'the Rock' for future generations. May God, who began this good work, grant us all the gifts of generosity and faith.